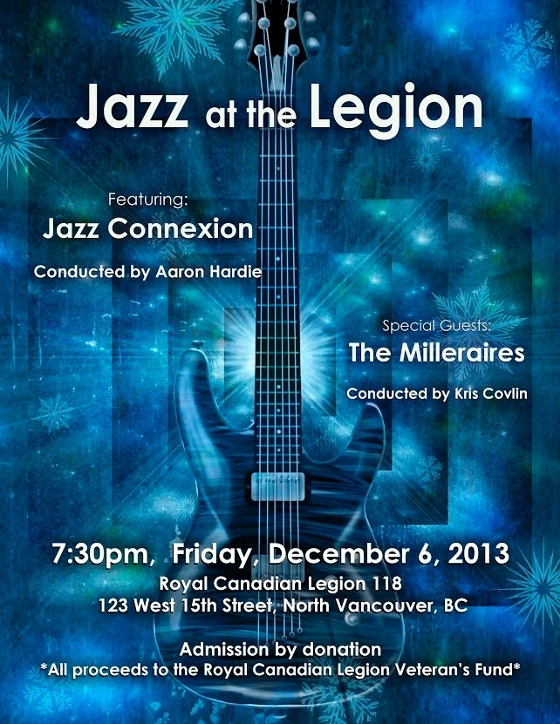 Join Dan and the Jazz Connexion for an evening of Big Band music Friday December 6th at 7:30pm at the Legion in North Vancouver (123 W 15th Street). The Jazz Connexion is a community big band that rehearses weekly on the North Shore (http://northshorebands.com/jazzband.php). They are excited to be joined by the Milleraires, another North Shore big band. Donations will be taken at the door with all proceeds going to the Legion's Veteran's Fund. These moneys are used to honour and support Veterans that have served our fine country throughout the years. Hoep to see you there!